Our olive oil mill is part of the Southern Aragón (Bajo Aragón) Olive Oil Regulatory Council since 1999. That same year our Extra Virgin Olive Oil “Torremaella” was granted for the first time with the Protected Designation of Origin stamp of quality, because of its exquisite quality and because it is a blend of the two traditional varieties of the area, Empeltre and Arbequina (a minimum of 80% and a maximum of 20% respectively). Since empeltre olives are autochthonous to our region, only the Extra Virgin Olive Oils containing a minimum of an 80% of this variety will be granted the PDO stamp of quality. Undoubtedly every olive oil aiming for this stamp of quality has to pass strict quality controls at the Tasting Panel of Virgin Olive Oil of Aragón. 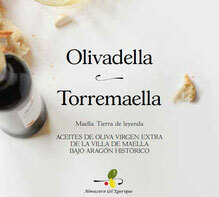 Both “Torremaella” and our single estate “Olivadella”, made only from arbequina olives, are regularly submitted to the analysis of the experts of the Tasting Panel of Virgin Olive Oil of Aragón, in which they always obtain excellent qualifications. You can find more information about the history of olive oil in our region including its characteristics, current legislation and other details related to our ´liquid gold´ in the Regulatory Council’s website.